We had a good night at the truck stop at the Pemex. I had the best sleep I have ever had at a Pemex. In answer to a question, this is Pemex #3970 which is at KM75 just North of Culiacan. It is a 4.5 hour drive from the Isla. I can’t understand why people would leave at 9AM and end up sitting in a hot parking lot in Los Mochis from 3PM on 😕 So we started yesterday, day 2 of our trek North at 7:10AM. The first delay of the day was at the fruit inspection place. The truck on the left blocked one of the check points and the bus was taking a long time getting all the passengers checked. Just a 15 minute delay but it could have been avoided. 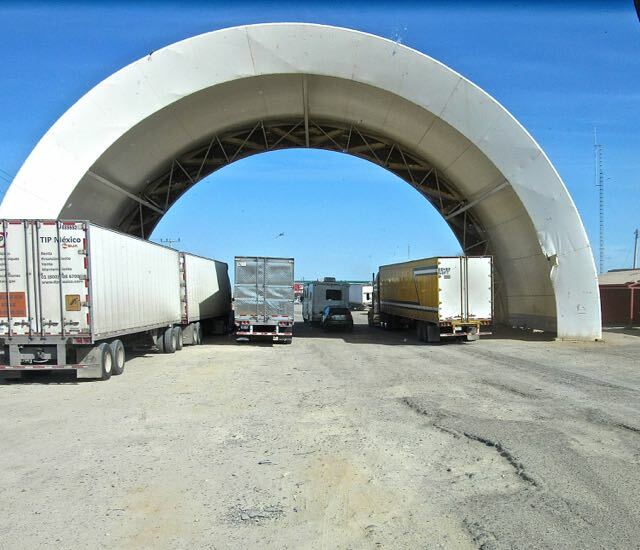 The trucks really get checked from top to bottom at their inspection locations. Here they are just starting to unload all the cargo to make certain that it matches what they are supposed to be carrying. 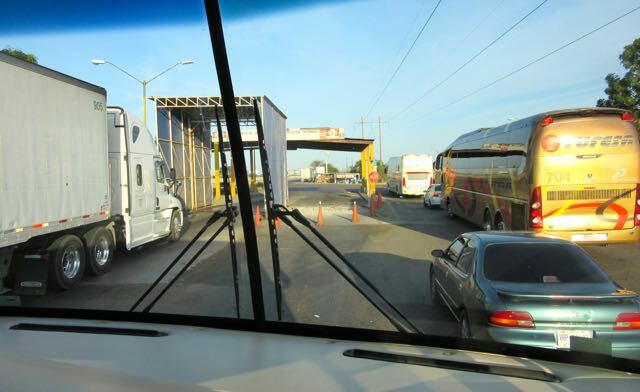 We all go through the same inspection area between Sinaloa and Sonora. You can see how badly the road is chewed up. Makes for some serious rock and roll of the RV. To be honest we felt that the roads were in better condition than they were coming South. 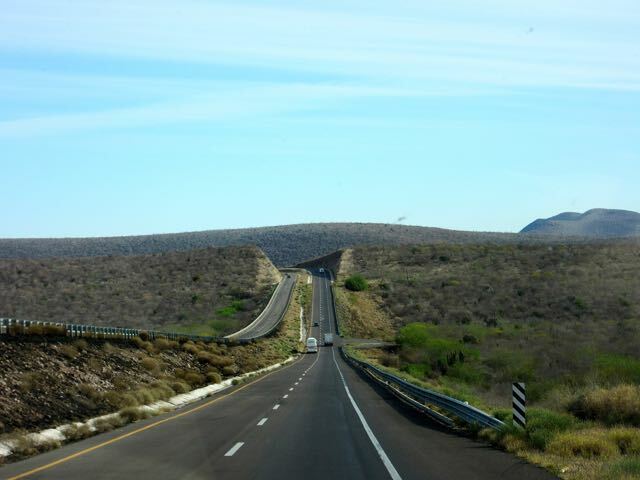 Here we are just moving from the border area to the main road in Sonora. They have done some repairs on the ‘bad’ roads which make the trip somewhat better. You can see on the right that the new road is in the process of construction. It will be completed by the time we return in November. Having said that we did get a rock chip on the drivers side of the windshield. It was caused by a car carrier as we passed it. I have already called for someone to fill the crack once we get to Lake Havasu as it is bothering Colin as he drives. So far it is very small and we don’t want it to spread. Someone is having a very bad day. 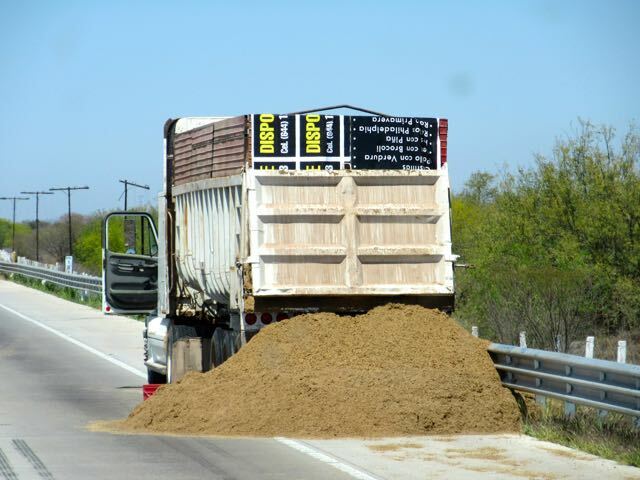 His load kept escaping. Some sort of mechanical failure. It was either sand or a grain. 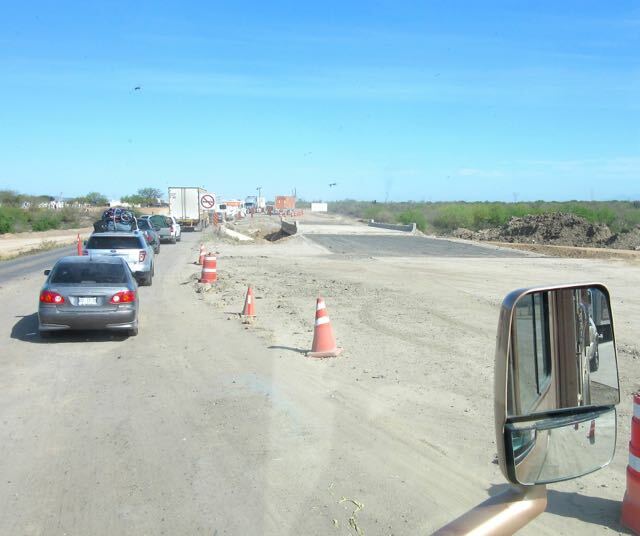 We took the new nicely paved Navajoa periferico which is about 7 miles longer than driving through the center of town. Having always enjoyed that drive, we will go back to that. I think it takes less time than the bypass. 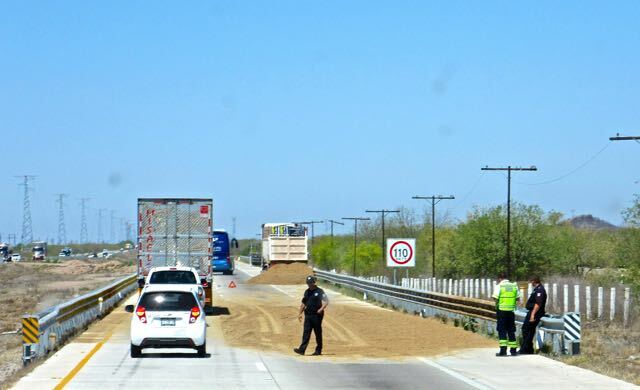 The new C. Obregon bypass was most welcome. What a wonderful road. Quite the drive through the countryside. It is not quite finished but what there is is great. Again it will be complete by next year. There has been so very much progress with building new roads over the last few years that soon the journey is going to be so very smooth. For those of us who have been doing this drive for 20 years it is like a miracle. This new bypass almost appears to be in the middle of nowhere, except you can see C. Obregon off in the distance. The roads in that city are more potholes than asphalt. This is where the new bypass ends but you can see that the construction on the final bit is in the works. 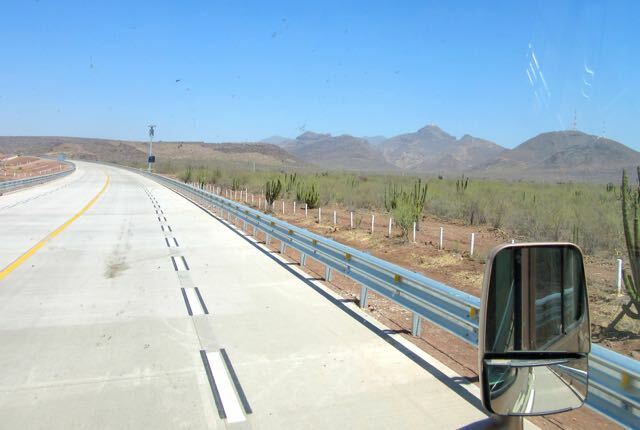 The cost for us for this bypass ,which officially is being called the Guaymas Cuato Libramiento, was 160 pesos/8.78USD/11.20CAD for four axles. Our RV has two as does our tow car. The board posting the prices quoted 73 pesos for the car and 160 pesos for the RV so we could have been charged 233 pesos but instead they charged us as one unit connected rather than two vehicles. However sometimes it cost more to be charged as one unit rather than two units. There doesn’t seem to be much logic to it. There was a second toll booth charge shortly after we got back on MX15 which was the normal toll charge after passing through C. Obregon. Here they charged us as two units which was 208 pesos ( had we been charged as one unit the toll would only have been 129 pesos ). What was going on? So we said that we had just been charged as one unit with 4 axles and why were they charging us more? Apparently a Libramiento is charged differently than a regular road toll. Most interesting and good to know. 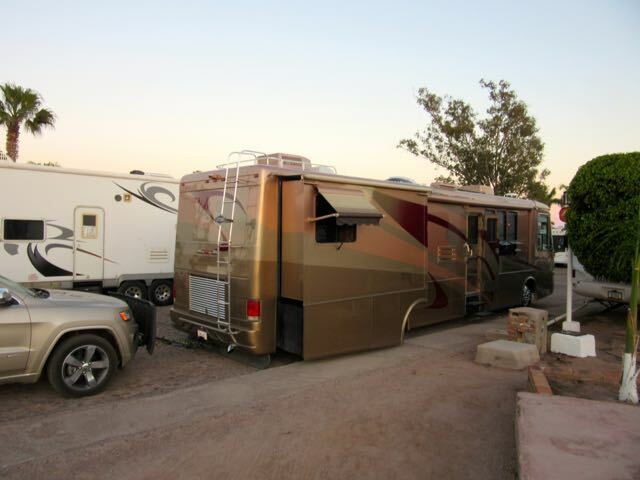 324 miles and 8.5 hours later we finally arrived at Totonaka RV Park. It was hot and dry, dry, dry. From 91% humidity on the Isla to 1% in San Carlos. We never plug in here as the electricity is off the charts and there are many known blown electronics which can cause thousands of dollars in damage. Even with running a heater we could not get any lower than 136. The only thing we do here is plug in our kettle in the outside post. We did however put a 15AMP cord through the bedroom window to run a cheap fan to try and circulate the air. Our failing inverter managed to give me enough power to do my post. Dinner was made on the stove top. Being a diesel RV, the engine is under our bed and it gets extremely warm in the bedroom. Happily it cooled down very nicely and we slept fairly well. We stayed connected and parked along the side of the main road, in the park. Certainly not worth unhooking and backing into a site for a quick overnight. A bit of sunset reflection. Certainly not the Isla. As I write this we are back in the US after a very long 457 mile day. More tomorrow. A nice travel day and moving right along. Continued safe travels. Gracias. I think we had all of our travel issues just before we left. The roads look so civilized and the country side beautiful. Mexico seems to be catching up. Then nothing ever stays the same and progress is made there, too. Hope you get everything fixed on your list. All the best. Mexico is most civilized. In fact many areas and cities are more modernized than parts of the US and even some in Canada. Wow, a bypass around Cd. Obregon! Going through there was always my least favourite bit of the trek. Great news! Poco a poco. We still were happy to travel these roads many many years ago when they were only one pot hole after another.